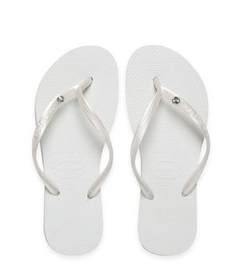 The first pair of Havaiana flip flops were born in 1962. Inspired by Japanese sandals with rice straw soles, the textured foot bed continues today to be an unmistakable feature. The brand has expanded its range into a multitude of colours and is sold worldwide. True iconic summer footwear - these flip flops have reached legendary status.